Lt. Gen. Ricardo Sanchez and Amb. 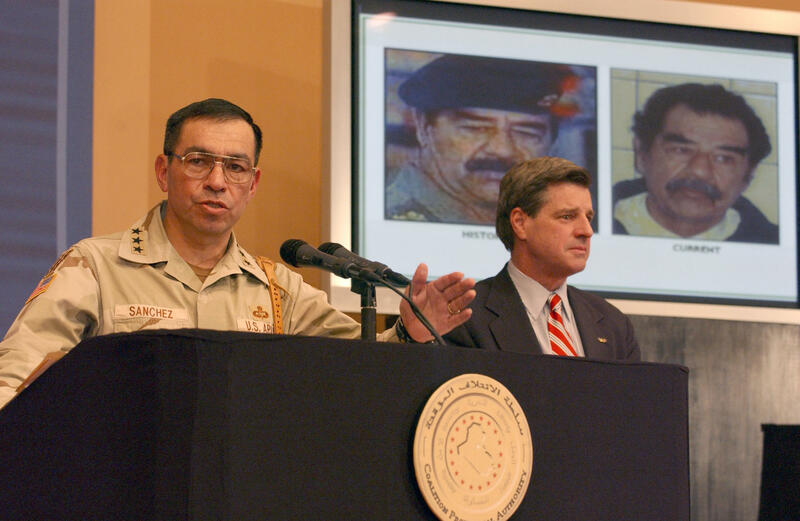 L. Paul Bremer speak to the media during a press conference at the Iraqi Forum in Baghdad, covering the capture of Saddam Hussein - December 13, 2003. Ten years ago Friday, hundreds of interrogations and months of intelligence work paid off for Eric Maddox when his fellow U.S. Army soldiers pulled deposed Iraqi dictator Saddam Hussein from the now-infamous underground “spider hole” near his hometown of Tikrit. More than a decade after the start of the conflict, and nearly two years after the final withdrawal of U.S. troops from Iraq, Maddox says once Hussein was apprehended, the U.S. had no idea how to rebuild the country. 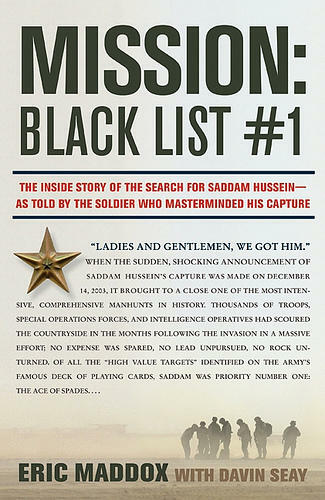 Maddox is the author of Mission: Black List #1 that details his experiences leading up to the capture of Hussein. The book is being adapted into a movie with Twilight star Robert Pattinson portraying Maddox. Serving as an Airborne Ranger earlier in his Army career helped Maddox adapt to unexpected situations. He quickly learned to empathize with his prisoners, put himself in their shoes, and earn their trust and respect. 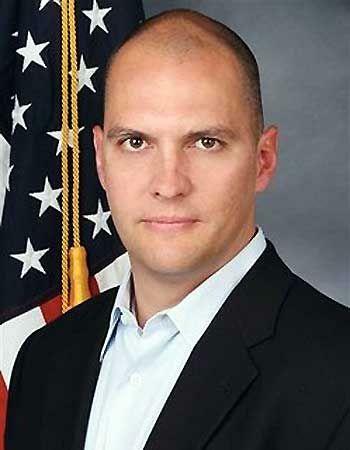 Maddox served during a tumultuous decade when military interrogators came under fire for so-called “enhanced interrogation techniques” widely viewed as torture. He says he’s never done it, but knows it exists and has seen the U.S. government and military do everything possible to eliminate it. When you're fighting an insurgency... you either win over the hearts and minds of the people, or you do not. If there are any questions of why Afghanistan's going so terribly, it's because the Afghan government cannot win over, they're not winning over the hearts and minds, and the Taliban are. So it was an example, and it took us so many years to get a handle on it and realize, 'Wait a second, we just can't play whack-a-mole with these enemy, we have got to build the infrastructure, and we've got to help build this government.' And it took us several years to do it, because we do not have experience doing that. They're sitting there with civilian clothes, and they're not actual soldiers, and in their mind, living under Saddam's rule is whatever you do, don't confess. So these two battles are going on. And in all actuality, they had problems. They wanted to go home. They had families that they were dealing with on a daily basis. They had jobs and responsibilities, and they needed to get home. And how do we do that? They've got to help me. I've got to take out their bosses in the insurgency. Well, if their boss is a family member, and they said, 'Well, I'm not going to help you take out a family member,' I've got to go above them. So they would look at me and go, 'Okay, here's the deal. If I give you my boss, they're going to know it was me, and they're going to kill me. But, Mr. Interrogator, I've got to get home, but if I give you my boss's boss, and then some other individuals I know you're not aware of, go after them first. Capture them, and then go get my boss's boss. They'll think those guys did it, and I'll be free to go home.' And I'll explain to this prisoner, 'You know, that's a great idea. And, because your brother's on this insurgency, I need you to go get him, and tell him to chill out. He's going to sit home, and he's going to do nothing. I need you to go home and live your life. I know where you live. I know how to get you. But you're going to sit there and you're going to live your normal life. Deal?' And he's shocked. He's amazed. He's thinking, 'I'm going to spend the rest of my life in a prison of the United States government,' but within two days I have these guys walking home, and they give us everything we need. SUZETTE GRILLOT, HOST: Eric Maddox, welcome to World Views. ERIC MADDOX: Thank you for having me. GRILLOT: Well, it's been ten years since you were involved in the capture of Saddam Hussein. Can you reflect, give us some thoughts from what you think; how that ten years went since you captured Saddam Hussein? There was such a tremendous amount of optimism and excitement, I guess, when you deposed the dictator and succeeded in changing the regime in Iraq, which is what we went in to do. We know how it went, but what do you have to say about how things unfolded from that point on? MADDOX: Well, that's a full question, but from my perspective as a military member, as an Army Staff Sergeant at the time, it was an exciting time. We felt like we were going to fight for our country, and we were going to take out a dictator who we'd all grown up knowing as a pretty evil man. And we felt that we were prepared. We went in and we did that. We overthrew the regime. We started hunting down the high-value targets. We eventually captured Saddam, but the problem I think, and it's just my opinion, is we didn't know how to end it. Because we had no idea how to rebuild a country so we're left in charge. So the average Iraqi is looking at the U.S. military and saying, "Hey, you're in charge now. You rebuild this." And when it didn't get rebuilt, and expectations were not met, they began to turn on us. From that comes an insurgency, and that's where your elements of al-Qaeda began to crawl into Iraq, and recruit disheartened citizens and foreign fighters, and from there it was an entirely new war. You actually have two completely different wars. GRILLOT: So there was the war against Iraq, the war against Saddam Hussein, the war against the dictator, removed him from power. And you said that you were prepared for that. You were prepared to fight that war. But then the second war started. The insurgency. Is that what you mean when you say there is this separate war? MADDOX: The second war of an insurgency led by foreign fighters and one in which we couldn't get a handle on the enemy and we couldn't win over the hearts and minds of the people. Because that's really...when you're fighting an insurgency, that's all you're doing. You either win over the hearts and minds of the people, or you do not. If there are any questions of why Afghanistan's going so terribly, it's because the Afghan government cannot win over, they're not winning over the hearts and minds, and the Taliban are. So it was an example, and it took us so many years to get a handle on it and realize, 'Wait a second, we just can't play whack-a-mole with these enemy, we have got to build the infrastructure, and we've got to help build this government.' And it took us several years to do it, because we do not have experience doing that. GRILLOT: So when you said you were prepared to fight the war, I have a question about whether you were prepared to do your particular job, because you've said in your book and you've said in other comments that you've made publicly that you received actually very little training to go in to be an interrogator. Now you served as an interrogator in Iraq. You interrogated many people leading up to the capture of Saddam Hussein, so were you prepared for that particular job? Because it seems to me like you didn't quite know what to expect. MADDOX: When I see were prepared, I'm speaking of the United States military in that we get the best training in the world. We had the numbers. We weren't exhausted in combat over several years, so myself, I was not prepared at all. I had never conducted an interrogation, and when I went over there and began interrogating, the techniques that I'd been taught absolutely did not work. I was taught to interrogate soldiers with a uniform and a weapon on a battlefield. These were individuals who lived everyday lives, had normal jobs, and were home in civilian clothes, and there was no evidence against them. And the techniques that we were taught did not work. I did, however, have years of being in the Army as an Airborne Ranger, where you learn to adapt. GRILLOT: So once you adapted, well first tell us how you adapted. You've made some comments about how you had to figure out how to put yourself in their shoes, and that is a tactic that helped you actually retrieve the information that you need. What do you mean by that? MADDOX: It is the number one principle that I believe. When I teach interrogations for an interrogator, you must completely put yourself in the shoes of the prisoner. Now, what does that mean? Well, we were taught that you should throw overwhelming evidence against them to try to break their spirit in order to get them to give a confession. Until you get a confession, you can't really trust anything that they say. Well they're sitting there with civilian clothes, and they're not actual soldiers, and in their mind, living under Saddam's rule is whatever you do, don't confess. So these two battles are going on. And in all actuality, they had problems. They wanted to go home. They had families that they were dealing with on a daily basis. They had jobs and responsibilities, and they needed to get home. And how do we do that? They've got to help me. I've got to take out their bosses in the insurgency. Well, if their boss is a family member, and they said, 'Well, I'm not going to help you take out a family member,' I've got to go above them. So they would look at me and go, 'Okay, here's the deal. If I give you my boss, they're going to know it was me, and they're going to kill me. But, Mr. Interrogator, I've got to get home, but if I give you my boss's boss, and then some other individuals I know you're not aware of, go after them first. Capture them, and then go get my boss's boss. They'll think those guys did it, and I'll be free to go home.' And I'll explain to this prisoner, 'You know, that's a great idea. And, because your brother's on this insurgency, I need you to go get him, and tell him to chill out. He's going to sit home, and he's going to do nothing. I need you to go home and live your life. I know where you live. I know how to get you. But you're going to sit there and you're going to live your normal life. Deal?' And he's shocked. He's amazed. He's thinking, 'I'm going to spend the rest of my life in a prison of the United States government,' but within two days I have these guys walking home, and they give us everything we need. GRILLOT: So in terms of the interrogation tactics then, obviously what it sounds like to me is that you're empathizing with your prisoner. That you're putting yourself in their shoes. You're taking their perspective and understanding what it is they need. Is that something that you think then that we've extended beyond just an interrogation tactic to understanding what the people of Iraq need? Or let's say if we extend it to another conflict in which we've been involved, to Afghanistan, are we empathizing with the Iraqis? Are we empathizing with Afghanis? Are we empathizing more broadly in our policy, or is this strictly just limited to an interrogation tactic? MADDOX: I really cannot speak to a broader picture. I can simply speak to what I had to learn and develop as an interrogator. It seems to me to be common sense. The difficulty is that I had to have commanders with the courage to let prisoners that they knew had been fighting against us, possibly even killed Americans, walk out the door two days after we captured them. When the commanders trusted me that I could let them walk out the door, and the result of that - to give information - then we could move forward on that. But this was something that I did. I cannot speak on a broader picture. I will say though, I do it in Afghanistan, and it's just as effective. Because at the end of the day, people just want to go home. GRILLOT: But what are they going home to? GRILLOT: I mean it's a tough life that they're living there right now. Are they going home to insecurity? Can you trust that they're going to go home and not continue to work against you in some way? How do you establish that relationship with them through that process? MADDOX: Well, at the end of the day, the main thing is once I gather all the information, I know exactly where they live. I know where all the relatives live. It's a situation where I'm Big Brother. GRILLOT: You know them well. You know them very well. And they know that. MADDOX: I spend dozens of hours with prisoners, and Tikrit, for instance, is a small town of 20,000 people. I knew every single road. Every neighborhood. Every family. And when I tell them, 'You're going to go home, because I can find you,' they would. Sure, they go back into a war zone, but when you have so many responsibilities, they would rather be out there. Most of these leaders, these senior insurgent members, they're A Personalities. So they need to take care of their families. Yeah, it's tough out there, but they'd rather be free. GRILLOT: So as an interrogator, I'm sure you're not surprised to hear that some have been critical of interrogation tactics that have been used. You have openly said that you did not use torture during your interrogations. That you did not torture any of these people leading up to the capture of Saddam Hussein. But then we know that torture does happen. There's significant evidence of that, and just to use an example, the capture of Osama bin Laden, for example, some have said, and I believe there's a movie - whether it's accurate or not - that demonstrates that there's been torture used to gather information. What do you have to say about that? Is this something that is common? Not common? Something that we should really be concerned about, or not? MADDOX: I think when you look at the history of torture over the last ten years, I would say it absolutely did exist in the early years, and I have watched...I've done eight deployments in the last ten years, just strictly as an interrogator. I've seen the United States government, the United States military, do absolutely everything in their power to get rid of that. To eliminate it. To remove it. It did exist, and then they tried to get rid of it, and there were slivers of it. They learned from their mistakes, but at the end of the day, I have a philosophy that when you, as a commander or as a solider, possibly even an interrogator, if your men’s' lives are on the line, they're going to do whatever it takes to get the information. So what we have a responsibility to do is to create and develop interrogation techniques that are far superior and more efficient than torture. That's the one way I can guarantee. I will do it my way even if I was allowed to torture. I will show and prove that the techniques that I use are faster and more effective. If we don't do that, there's no way to guarantee that it's going to be completely eliminated. GRILLOT: So you've written about these tactics. You've spoken publicly about these tactics many times. Is this catching on? Is the U.S. military and the U.S. government using more and more of the kinds of tactics that you are promoting here? MADDOX: I'm frequently asked to go teach, talk about, and discuss my tactics. If elements of the military use them, I know that the elements that I'm ever with, they readily accept them, and ask me to teach them, but I would say at the end of the day, 95 percent of the U.S. military interrogator do not know my tactics and they haven't been introduced. And it's not because I'm keeping them a secret, I just haven't been asked to teach it on a broad scale. GRILLOT: So is this why we see insurgency continue today? We're talking ten years now in Iraq. Longer than that in Afghanistan. Is it your solution that will help us defeat the insurgency? MADDOX: I think there are so many elements that would need to be done. If we go back in history, to how we solve those problems, I would say that it's just so difficult to expect a military to do nation-building. I do not think that responsibility should be put on a military. I think we need to really reflect and go, 'Do we really want to go into this war? Because it is going to be a war, and what the heck are we going to do when we're stuck having to rebuild this country? Is this really what we want?' But yes, I do believe interrogation advances can help. All sorts of things we can go back and look at, but I think at the end of the day, we need to question, 'Do we need to do this? Is it absolutely necessary?" MADDOX: I'm very excited about it. The one thing I've asked is that the movie be as real as possible. And working with Rob, that's the one thing he insists on. He always asks me, 'Is this real? Did this happen?' So it's exciting. We'll see. GRILLOT: Well we'll be looking forward to that in the next year. GRILLOT: Thank you for joining us on World Views, Eric, I appreciate it. MADDOX: My pleasure. It's great to be back.